Quietway 7 is part of a network of proposed quieter, low-traffic routes across London designed to make cycling and walking safer and more pleasant. The proposed Quietway 7 runs from Elephant & Castle to Crystal Palace, with the Lambeth section running through Thurlow Park and Gipsy Hill wards. We have consistently sought to ensure residents and local businesses have the opportunity to input into the design of the Quietway – pushing officers and TfL to withdraw plans for an experimental road closure and organising events, workshops and online questionnaires over the last two years. 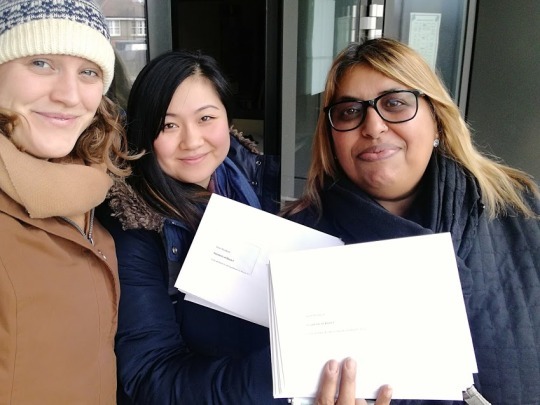 Recently, we were concerned that a decision had been made without some key changes residents asked for being implemented, and without any further opportunities for the local community to engage. We therefore got this decision reversed, and over the summer we organised a number of meetings with groups such as the local businesses and the allotments with officers and designers, as well as a public meeting in each ward and meetings with individual residents who have requested them, and some changes have been made to accommodate concerns raised. Where changes we wanted to be made weren’t able to be accommodated by designers, we escalated to a meeting with the London Cycling and Walking Commissioner to make sure residents’ voices were heard at the highest possible level. A consultation and detailed feedback from officers has been launched here – lambeth.gov.uk/quietway7 – where you can provide feedback until 5 November 2017. We have also organised an event in the afternoon of Saturday 21 October at All Saints Church. This is to ensure residents have further opportunities to discuss the designs with councillors and look at hard copies of the plans. We anticipate this being a busy event, so ask that you choose a timeslot to enable us to accommodate everyone who wishes to participate. Please stick to your chosen timeslot so that we can make sure we are able to hear everyone’s views. You can sign up here. If you can’t make it, please do get in touch and we are happy to visit you at a later date to discuss individually. 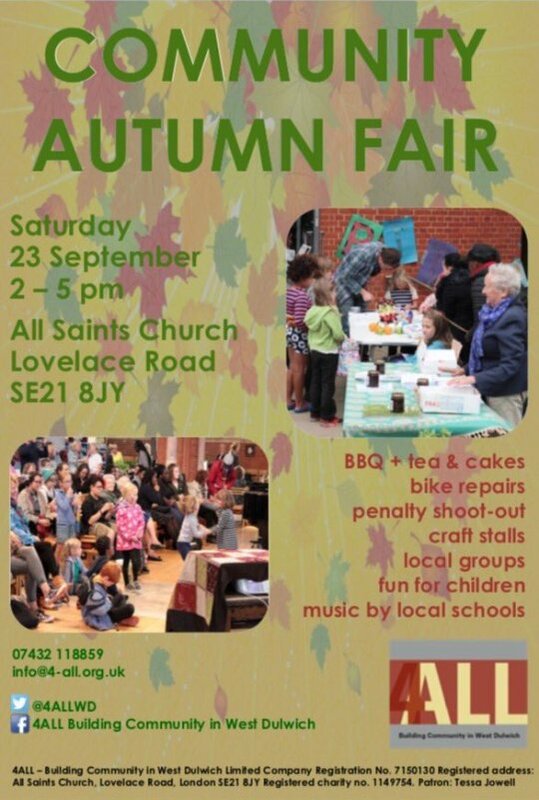 The 4all Autumn Fair is an annual fixture in the Thurlow Park diary – a great afternoon of activities, community groups, craft stalls, music, games for children and a BBQ, tea and cake. It takes place at All Saints Church on Lovelace Road from 2-5pm on Saturday 23rd September. Your local councillors will be at the Fair to listen to your ideas and concerns for the local area, and to provide any support or advice you may need. the scheme doesn’t inadvertently cause issues for individual residents. Anyone who couldn’t attend, we have offered to visit individually – do let us know if you would like us to come and meet with you. been unable to attend meetings. take on board local residents’ and stakeholders’ input. circulate plans by email and on the Lambeth website. revisit sections where the designs weren’t good enough. We were also concerned that cycling groups didn’t support the designs either. access needs of the allotments. re-examined by designers who will come back to us with some new ideas. by Scotch Meats so that we retain shopping parking spaces, following our meeting with businesses. quality than was possible when Boris was Mayor. that cars must slow down instead of swerving round corners. As cyclists and pedestrians ourselves, we think that reducing average speed and preventing excessive speeding will have the greatest positive impact on Rosendale Road in terms of it being and feeling safer to travel along. We’re pleased that we will be able to invest in cycle parking and greening, and to work with businesses to improve the area outside their shops further. reduce speeding on their roads too. Helen Hayes, MP for Dulwich and West Norwood explains why she is supporting a private members bill which calls for measures to reduce homelessness. Helen has been doing a lot of work on housing, through casework at her regular surgeries with residents and through her role on the Communities and Local Government Committee. It is a huge issue here in Lambeth – every week residents come to us and to Helen for help as they are threatened with homelessness or have experienced it. While the council is doing all it can to build new council homes and support vulnerable residents, more needs to be done to ensure that people who are in desperate housing need are not turned away. The Housing (Homeless Persons) Act of 1977 went a long way to ensure homeless people with priority needs are housed – Helen’s work with her colleagues on the Select Committee will, almost 40 years later, seek to build on this reform.